Ready to Feel the Love? For the first time ever, it is safe for me to say that I love my job. No, I’m not getting paid extra to say that. I know what you’re thinking – “Nobody loves all of their job.” Yes, that may be true. But I love all the scary, hairy, nonsensical parts of my job that make my eyeballs hurt from staring at my screen for hours on end and make me sigh at the end of the day because it’s been long and I’m drowning in emails. I love my co-workers. I work with a bunch of amazing people. My “bosses” (I put them in quotes, because they don’t like to be known as such) are amazing teachers and I love learning from them and WITH them every day. Their excitement over changes in the Internet inspires me to then get excited and pass that on to my WebOps. And don’t even get me started on my WebOps. My “girls,” as I’ve taken to calling them. I think what I love so much about my new role is the training and daily interactions with them. I love that they call me with questions, concerns, the need to rant and anything in between. It’s incredibly satisfying to know that I’m helping them become these magical unicorns of the Internet, as we like to call them. Even the worst clients are clients I want to do good work for. Watching a client go from not having a website to being the B pin on a Google map when you search for their industry and having Facebook traffic and getting retweets on Twitter is having all your hard work realized. All those back and forth emails. All those phone calls. You’ve made them THE person for what they do in their market, and you’ve made a believer out of them that what you’re doing is important. When you can get all “woo-woo” about your company’s work, I’d say it doesn’t much feel like work at all. Ok so, playing on the Internet all day every day has its advantages. Although, I don’t get to sit and look at Pinterest for that perfect pie recipe like you might think. (And if you ask my Mom, that’ll never happen anyway.) I do get on Pinterest to look for ideas for posts for my clients, but it’s never for my own personal time. I’m constantly plugged into Facebook, Twitter, Pinterest, and the back end of 10-15 different sites. I have two huge monitors and they never feel like enough. So once I go home, my desire to “pin all the things!” has decreased, and I feel like I have a better work/life/fun balance. It’s the Internet. It’s constantly changing. Keeping us on our toes, forcing us to learn. If I don’t have the answer to a question, I immediately turn to Google to figure out the answer. Resourcefulness is just part of the job. We are the antithesis of “corporate.” I can wear jeans every single day to work, and I do. (Once the Georgia summers hit though, it’s cotton skirts. Every. single. day.) But I don’t need to dress a certain way to appease my higher-ups. That frees me up to be comfortable at work, and I can focus on the work itself and providing customer service to our clients. We laugh. I think if you’re working at a job where you can’t laugh every day, there’s something wrong. 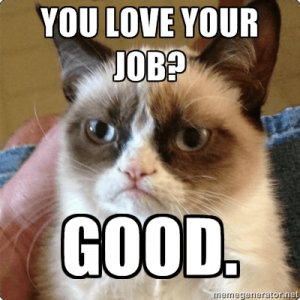 What do you love about your job? If you don’t, what do you wish for your job? What an absolute pleasure to read this post today! As busy as we are lately…and through all of the noise that comes along with it, I never really lose sight of why we are doing what we do. As I drive to and fro I always recount the great things about what we’ve built in TrustWorkz®. You are one of the integral parts of that greatness. Thank you for being you, and thanks for these words…I will ponder them daily! Awesome posts! I laughed and cried! Thank you for being such a great leader Ashley! YOU ROCK!!! You’re a great boss! Rock on, Ashley! So glad you guys enjoyed the post! I loved writing it, because every word is true. Thanks for being my inspiration!